TDSB is committed to creating an equitable school system where the achievement and well-being of every student is fostered through rich,culturally authentic learning experiences in diverse, accepting environments where all are included, every voice is heard, and every experience is honoured. 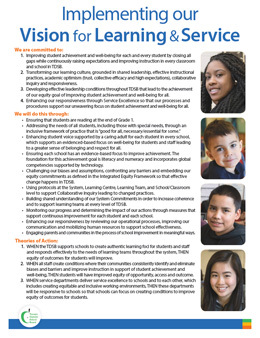 Each school will determine a learning focus in three areas: equity, well-being and achievement. In addition to identifying the three focus areas, this process will include engaging in the learning to support student improvement in these areas, determining the evidence and data to be collected and monitoring progress. 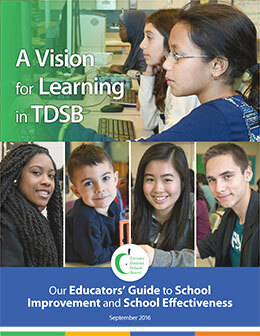 Learn more in the A Vision for Learning in TDSB document.